Yully’s father-in-law loaded two large duffle bags of gear and clothes and two large plastic zippered bags full of food onto the back of his motorcar and secured them with a rope while Yully and I crammed into the back seat with three backs packs. Yully’s husband Victor rode behind us on his motorcycle. Our procession wasn’t as extensive as as Presidential motorcade, but Victor was definitely providing security. It’s not uncommon for thieves to try to take unsecured items off the back of a motorcar at a stop light, and the risk of losing items when entering the chaos of the port is even greater. As we got within a hundred yards of the entrance to the dirt road leading down to the dock, one man grabbed the upper side of the motorcar’s carriage on my side while another grabbed the other to stake his claim for the right to carry our bags onto the boat. Stopping inside the port, at least four more men began to grab one of our bags and it took all of Yully and Victors’ assertiveness to award the winning contract to just two of the would-be porters. 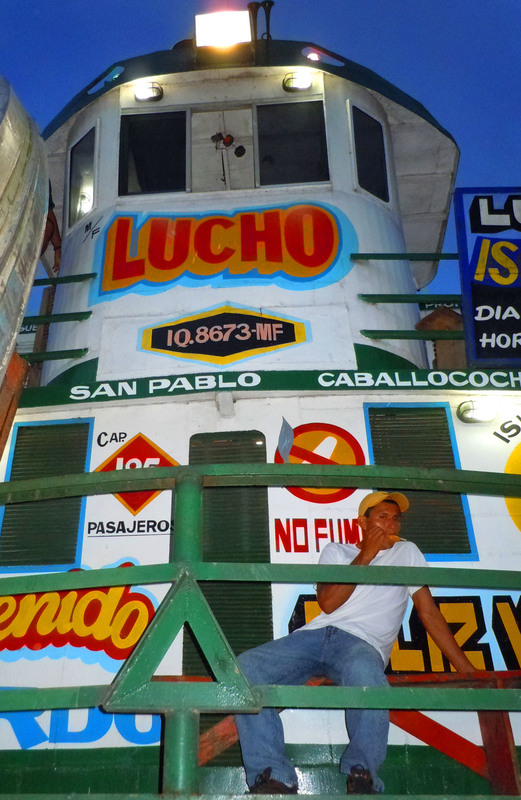 We walked up the gangplank of the Lucho – a typical Amazon ferry that legally carries about 150 passengers and cargo. Less than a year ago, there was a string of accidental sinkings caused by the overloading of boats with twice the number of permissible passengers and half the number of required lifejackets that finally prompted the authorities to start enforcing their regulations. They actually now require checking each passenger off a list of people who have purchased tickets. We always try to get a “camarote,” a small cabin with two bunk beds for these 15 hour boat trips – in part for some comfort but mostly so we have a secure place to stow our gear. Even though Yully went down to the port earlier in the morning, the only space available was one bunk in a cabin already reserved for one woman going all the way to the Peruvian frontier with Brazil. By the time we got all of our bags into the tiny cabin, the space below the bottom bunk and next to the bunk were full, and Yully had about two-thirds of her upper bunk left to curl up in for the night. I slung my hammock between two women each sharing theirs with a young daughter. Our fellow passengers were mostly Peruvians heading down river, but we loaned an extra travel hammock to a 20-something British woman traveling with a German companion. The boat shoved off a bit after 8 pm and I settled into my hammock to read, doze, have a tuna and cheese sandwich for dinner around midnight and then go to sleep. When one gets used to the noise of the engines, their absence can be jarring so I awoke at dawn as the captain gently nudged the boat close enough to the bank to allow passengers and cargo to exit and enter without grounding it on the mud. This town was distinguished by its plethora of small rafts of logs tied with crude cables waiting to be hauled into a sawmill perched on the upper bank. One worker continually walked from a side exit of the mill to the top of its little hill to toss planks onto a pile of sawdust and waterlogged discarded timber accumulating at the river edge. As we backed off and continued our eastward journey, a “steward” on the boat made the rounds of both decks and offered everyone a complimentary breakfast of a cup of watered down oatmeal and two rolls. 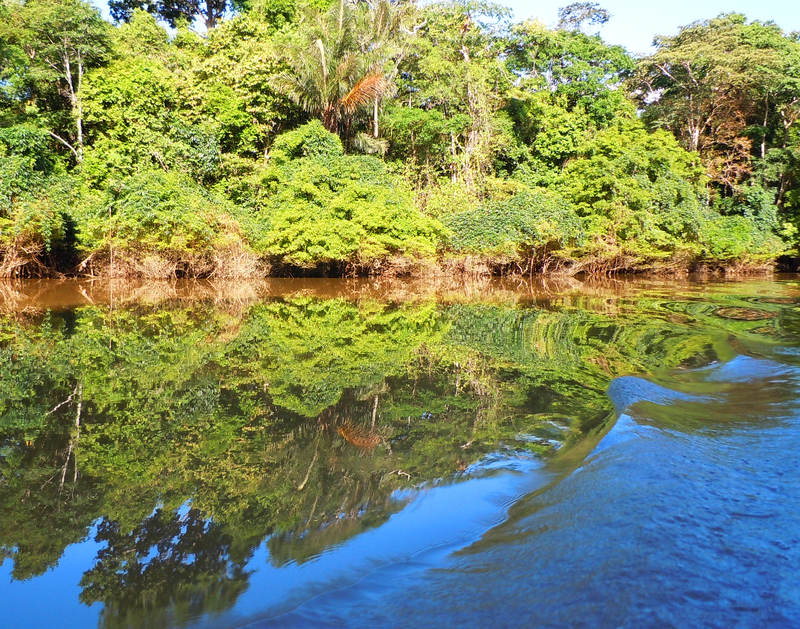 Change along small towns along the Amazon is slow but is sometimes noticeable between visits. Arriving in Pebas one great improvement was a bridge that linked the upper level of the town with a floating barge on the river that allowed easy transfer of people and cargo from boats to the town without the perennial hazard of slipping on steep muddy slopes. We were greeted by several old friends – Rolando Panduro and his wife Felicita Butuna. 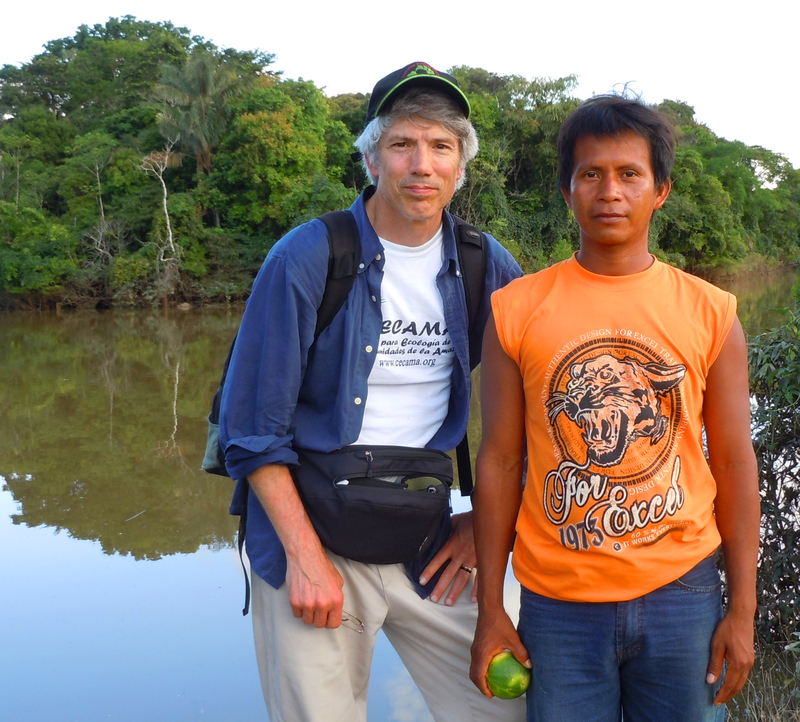 Rolando had been my cordial host and main village contact in 2009 and our initial project coordinator in 2010. I appreciated all that he did for us, but as time went by, it became apparent that our interests were diverging. 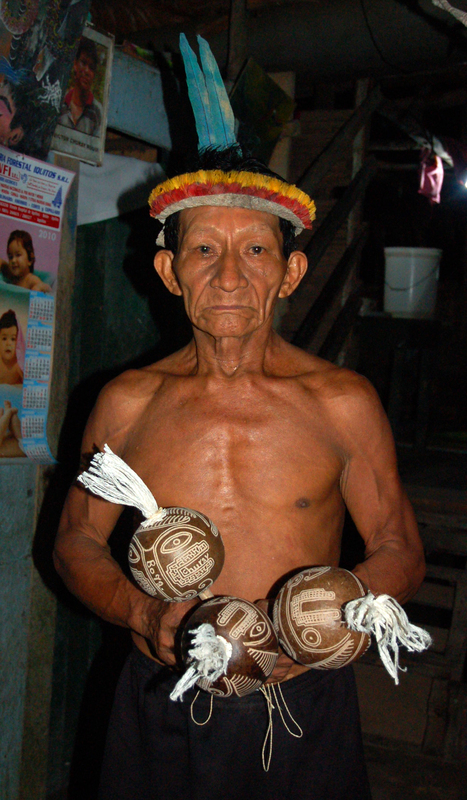 In the last elections, Rolando became a representative in the local government and moved to Pebas. As the main organizer of the artisans in Brillo Nuevo we had consulted Felicita about every aspect of developing this work. She also prepared our meals and washed our clothes. 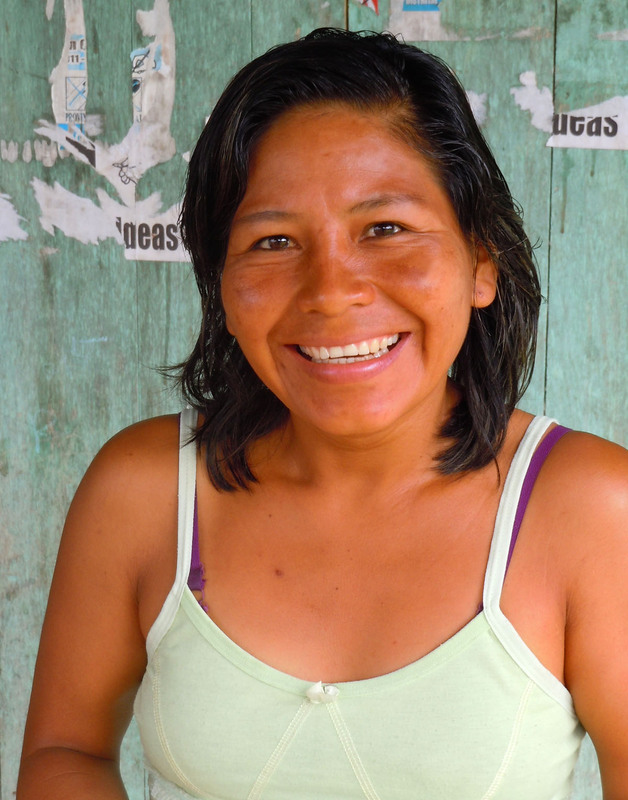 I had spoken with her most recently when we interviewed her and her aunt Ines on the phone during our Spirit of the Amazon fundraising party. It was interesting seeing her in a nicer blouse and fancier jeans instead of her usual day wear in the village. Yully and I were happy that “Feli” still wanted to keep making crafts with us. Our main task for the day was to make contact with the three villages that had been provisionally designated as sites where we could expand our project. We only needed to take a two minute ride in a motorcar to get to our first stop – the Yagua native village of San José de Piri. It’s hard to imagine how a native group could maintain its own sense of community adjoining a mainstream river town, but at least the border between Pebas and this village was distinct. It had the familiar layout of both native and campesino villages with a ring of houses made with crude planks and thatched roofs surrounding a soccer field. The few permanent structures were the school, health clinic and meeting house (the “local”). 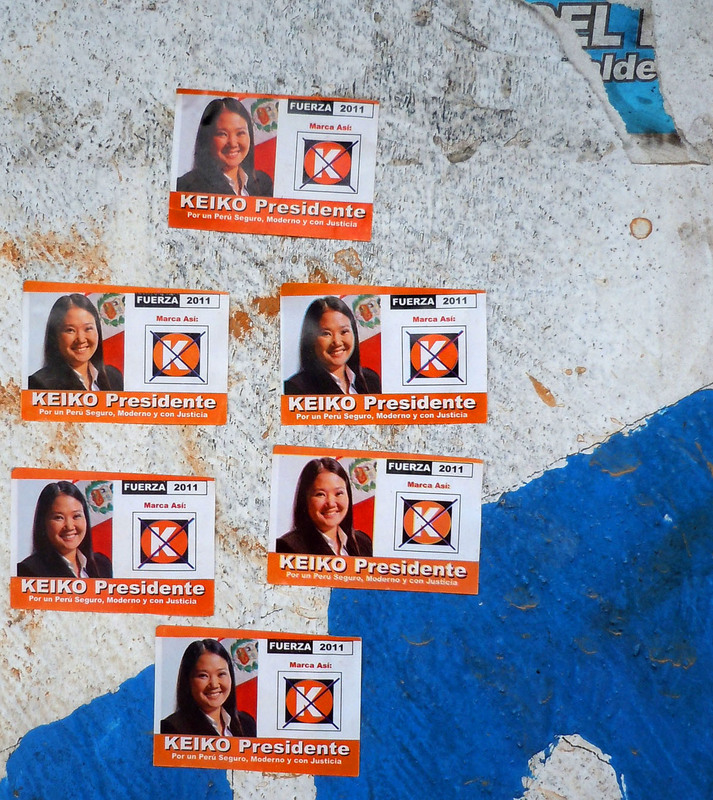 Many had candidates from flyers and other propaganda from the recent election still on their walls. At least some people in the village knew in theory that we were going to arrive sometime, but protocol demanded that we find the highest ranking “authority” in the village. While some native villages still have a “curaca” (traditional leader) that presides over occasional festivals, they all now elect a slate of conventional officers (President, Vice-President, Treasurer and Secretary) to convene community meetings and take care of some official business in between. Arriving in such places, the odds are good that most of these people are going to be off in the city, off in their chacras (farm fields), off fishing, hunting, or off in parts unknown. The first few people we encountered didn’t seem to know who the current President was, but after walking up and down the village a bit we ended up in the house of the Vice-President. He was very cordial, said he had heard something about our group’s interest in working there from the association FECONA, and after carefully scrutinizing a letter of introduction, agreed to give us a proper tour of the village and environs and convene a general meeting of the community two weeks hence on our way back to Iquitos. 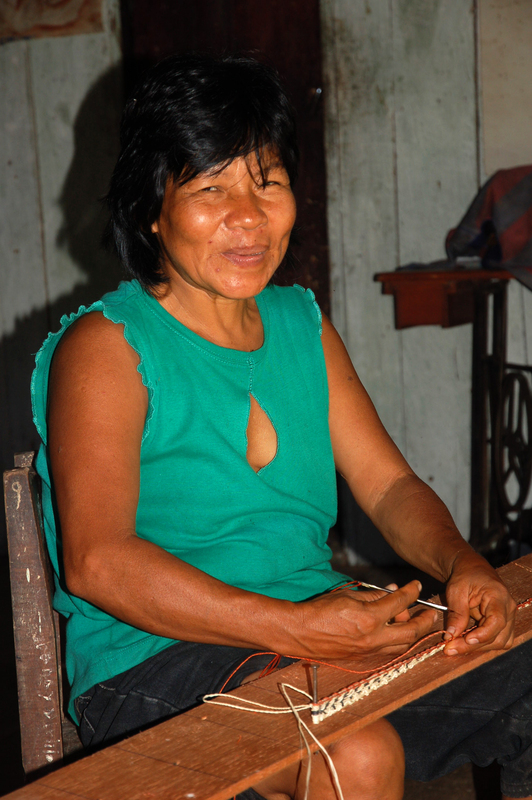 We were excited to learn that artisans in the village made a variety of handicrafts based on Yagua traditions. 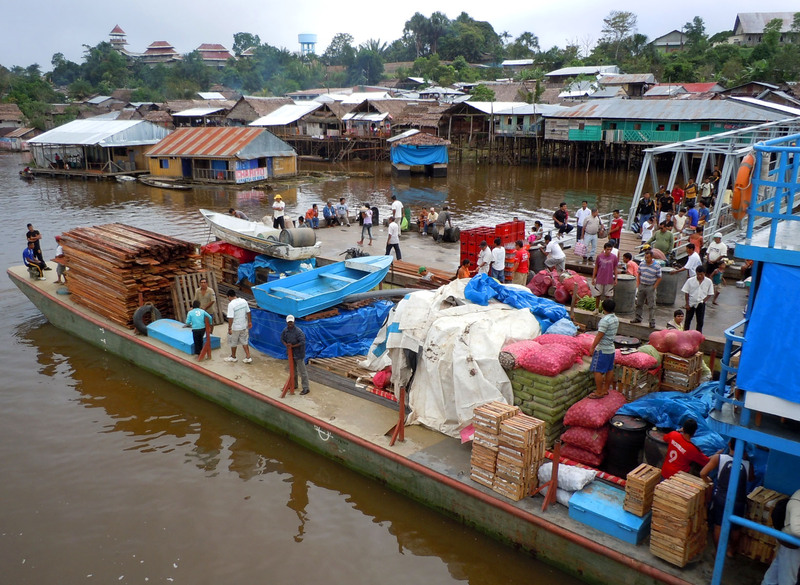 Finally boarding our well-loaded “peque-peque” (a long wooden canoe with an equally long propeller shaft powered by a small engine), our local project coordinator Beder guided us the Ampiyacu River for about 45 minutes before arriving at the village of Puca Urquillo. 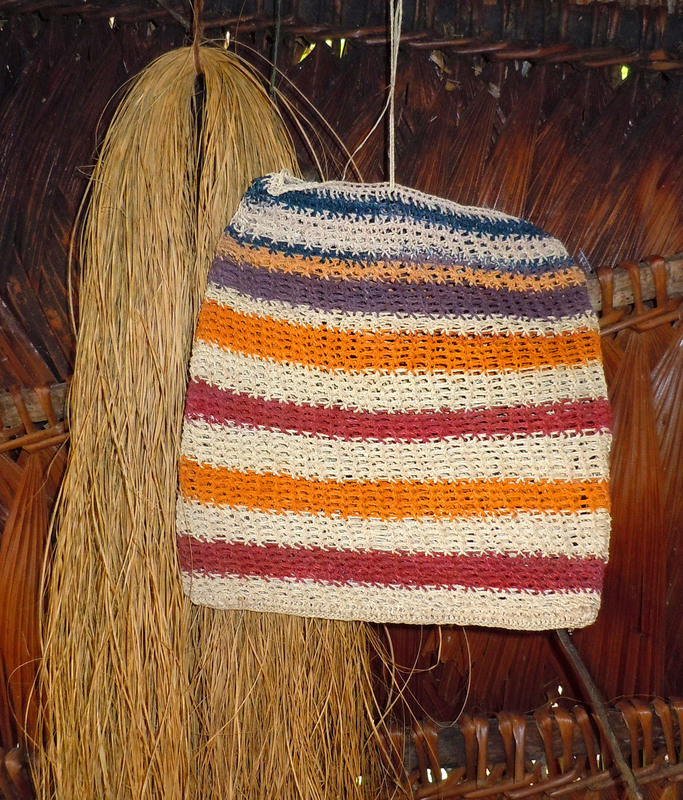 We climbed up the steep mud hill pausing briefly at a house where two women were busy weaving brightly (artificially) colored chambira bags (commonly called “xicras” – pronounced either as “shicras” or “hicras”). 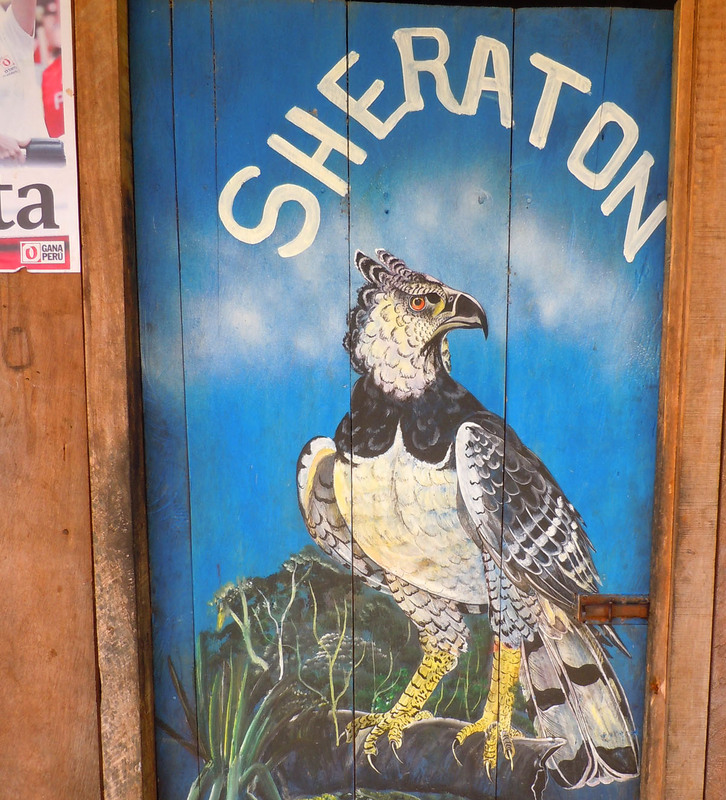 Proceeding up to the central area, we first tried to see Percy, the village President and prolific painter whose house was easily identified by the eagle on the door. Neither her nor other elected authorities were around, but we were welcomed by the “curaca” Victor Churay who could act as a substitute. The first order of business, though, was emptying a large empty sugar sack full of 20 maracas that Victor had made – presumably for me. These rattles were made of whole “wingo” (calabash) fruits that had been stained brown or black with a juice from a local fruit tree. Some had complex geometric patterns etched into them; other patterns were of classic Indian figures. I started out picking out the ones I wanted, but after a quick negotiation, I took the whole lot save one. In my last photo of Victor he had donned a narrow width headdress made of yellow and red toucan feathers. This time Victor had on his more usual well-worn green baseball cap. 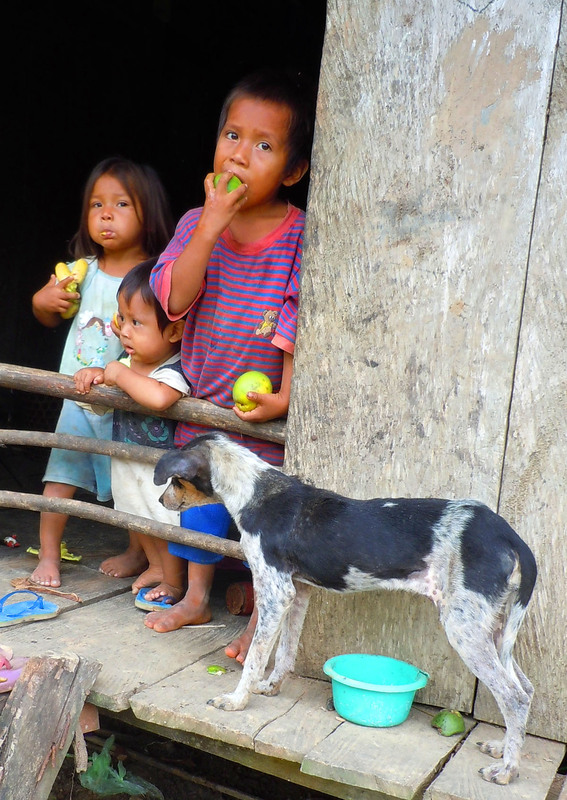 He readily agreed to help convene a meeting with the Bora side of Puca Urquillo when we came back through the village. 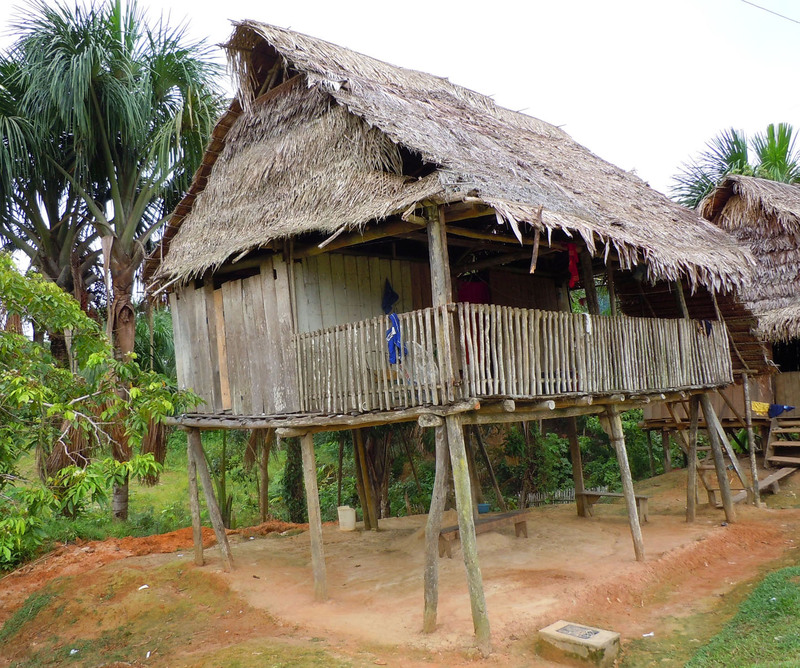 One unusual aspect of this village is that there is a large group of houses of Bora families in one half of the community and an equally large group of Huitoto native families on the other side with a shared school, clinic, and regional office of FECONA in the middle. This was not surprisingly vacant on Sunday as we passed over to the Huitoto side in search of some authority. We eventually found someone to receive our written request for a meeting to discuss our project and got back in our boat. Boat travel often involves dealing with extremes of rain or heat. This time Yully dozed in the middle seat with her umbrella clenched at her side to ward off the intense midday sun. I lay down in the boat with my head on the bag of a teacher we were giving a ride to Brillo Nuevo and read my book about the rise and fall of Comanche indian dominance of the southern plains of the U.S. in the 1800’s. It’s hard to imagine how tough life was for both the Indians and the American settlers. It was easy for me to feel sympathetic in principle for the Indians who were displaced and ravaged by the relentless expansion and diseases of white people moving west. It was equally understandable how grotesque violence perpetrated against “innocents” provoked a desire to punish and even eradicate the responsible parties. Arriving several hours later at the Ocaina village of Nueva Esperanza was another reminder of how the expansion and conflicts of white people had tremendous impact on indigenous people in the entire region. 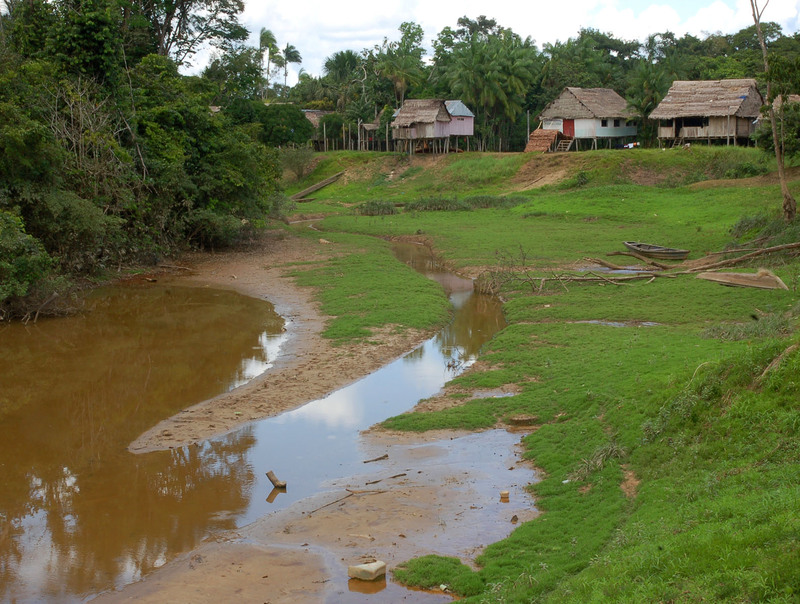 The Yagua were once the dominant ethnic group in this part of the Peruvian Amazon. Some eighty or ninety years ago, many Bora, Huitoto and Ocaina natives were basically slaves collecting various forest products in Colombia. A political conflict forced several large land owners to abandon their holdings, but they took their native slaves across the border into Peru. They ended up in the Ampiyacu and pushed out the Yagua. Decades later the transplanted groups have more coherent social organization while Yagua villages are dispersed throughout the region. 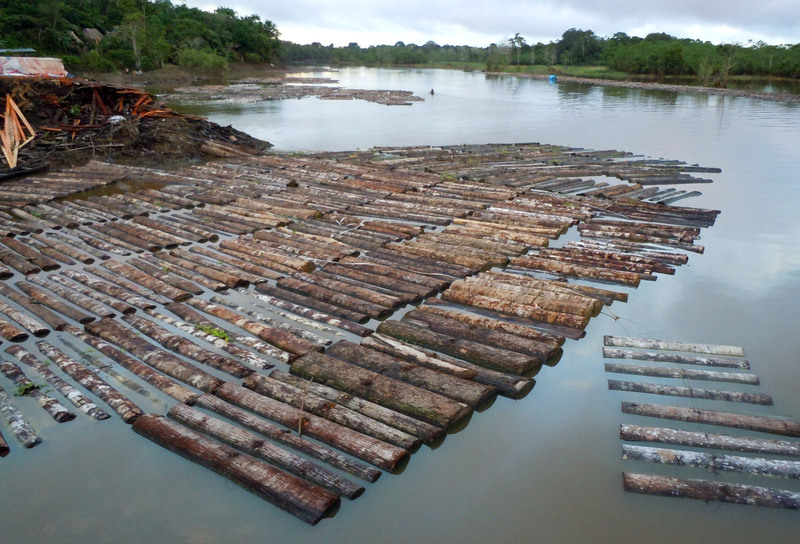 Communities are free now, but are subject to a lot of pressure and opportunities to sell timber to local logging companies. We had a brief but productive meeting with an Ocaina authority and got a quick taste of a few of their handicrafts before continuing up the the Yaguasyacu tributary of the Ampiyacu to Brillo Nuevo. Arriving in Brillo Nuevo at different times of the year can impose extremes of travel and getting around. Yully told me that near the end of summer last year, they had to dock their boat near the first edge of the community because the stream leading to the upper end where we normally stay was completely dry. Five months later in the peak of the rainy season, every house within a few hundred yards of the river was surrounded by water. A few families that didn’t have their own canoe were virtually stranded in their own homes. I was blessed again by arriving in a temperate time. I hadn’t been to Brillo Nuevo in a year, but after five previous visits and living vicariously through the twists and turns of village dramas and our project through Yully, it felt like arriving at my Amazon home away from home. 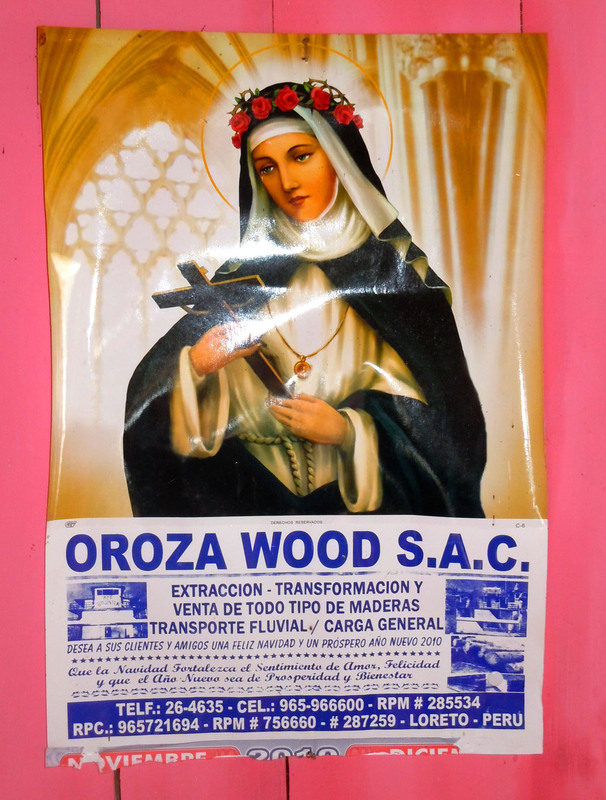 This was not an easy new status to accept since the Tembé village of Tekohaw where I spent the better part of two years had held this spiritual center for me for more than a decade. I’m still meeting new people here, but it’s hard not to feel welcome when every passing child greets me with a boisterous “buenos dias” or “buenos tardes” and more than half of the adults salute me as “doctor.” I had hoped that my Bora name “kanepa” – the word for upland copal resin might stick, but I’ve had to accept the more common term of respect as endearing in its own right. Most people here are still fluent in Bora, but they all use their given Christian Spanish sounding names. I had hoped we could again set up camp in the usually vacant house next to Marcelina – a good natured artisan and owner of the house with the only public telephone in the village, but it was fully occupied with several young school teachers. I was pleased to be offered a small room in Marcelina’s own house where I could lay out my gear on a wooden bed frame as string my hammock. The energy of some of our best friends in the village was a bit low, though, because several sisters were suffering from what seemed to be the same kind of sickness – diarrhea, mild fever, and fatigue. I certainly hoped to avoid the same fate. We met with the community President long enough to learn that we could be the first item of the agenda for a community-wide meeting planned for Monday morning and spread the word we would meet with the artisans in the afternoon. After a simple (as always) dinner of spaghetti mixed with a can of tuna and tomato sauce we went to bed. 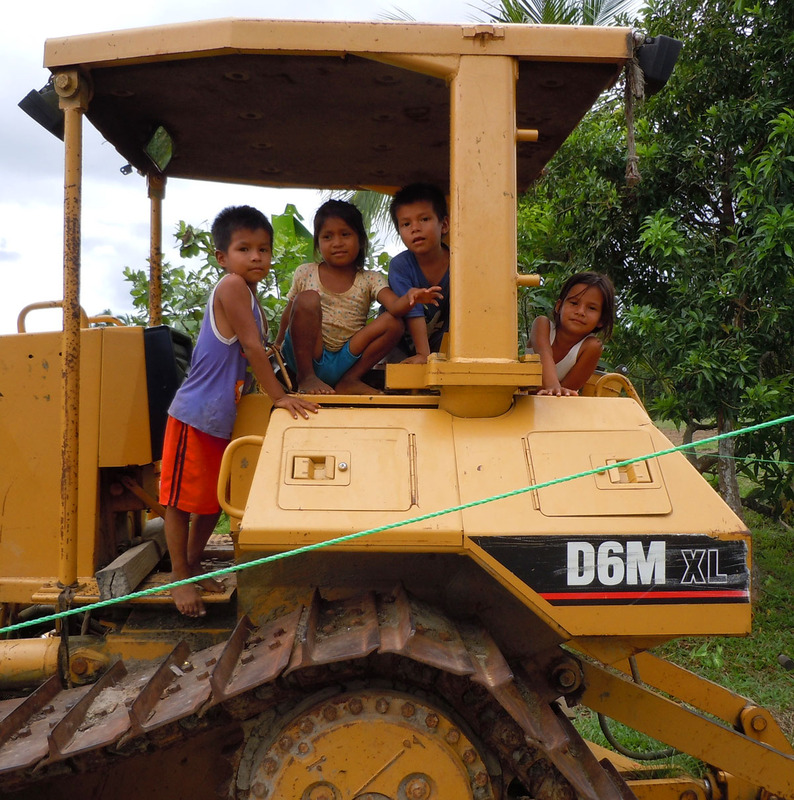 For more information about the programs of the Center for Amazon Community Ecology, visit www.amazonecology.org.